Without fanfare, Internal Revenue Commissioner John Koskinen at a House hearing this month let it drop that the estimated cost of IRS compliance with the document demands of multiple congressional committees has reached a new high: $18 million. That figure—up from $7.9 million in February 2013—includes $10 million for 250 employees who, as of June 15, had logged 120,000 hours screening documents and emails from 83 IRS staff members, according to Koskinen’s mid-June letter to committee leaders in both chambers. An additional $6 million to $8 million has been spent on adjustments to information technology equipment and software. Costs notwithstanding, Issa and other Republicans show no signs of easing off their search for smoking-gun documents that might incriminate Lois Lerner, the former head of the IRS’ Exempt Organizations Division, who took the Fifth rather than explain her actions in singling out the applications of some conservative nonprofits for extra scrutiny. Rep. Steve Stockman, R-Texas, on June 10 filed a House resolution to compel the sergeant-at-arms to arrest and jail Lerner, who retired in September 2013. The House voted this May to hold her in contempt. But most House leaders opted instead to continue pressuring the Justice Department to appoint a special prosecutor or indict Lerner as part of its ongoing probe into whether IRS criminal activity was involved in the so-called targeting scandal. 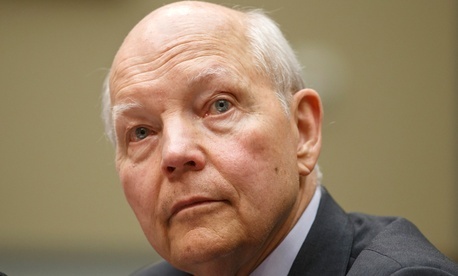 Issa and Rep. Jim Jordan, R-Ohio, elicited a promise from Justice that its probe of the IRS would include Koskinen’s delay in informing Congress of the agency’s April 2014 discovery that some of Lerner’s emails had been lost in a 2011 computer crash. Their volley was returned at the Thursday hearing when Cole and Cummings both cited a 1984 Reagan administration directive written by Justice’s Office of Legal Counsel attorney Ted Olson saying U.S. attorneys maintain discretion over whom to prosecute regardless of any congressional resolution. Meanwhile, the independent National Taxpayer Advocate last week released her mid-year objectives report, which included implications that the IRS and its critics are likely to spend even more money before there’s any resolution to the conundrum of how the tax agency should balance the role of politics in processing applications for tax-exempt status. Though the IRS has demonstrated progress on nine recommendations for fixing the Exempt Organizations Division, issued in May 2013 by the Treasury Inspector General for Tax Administration, the taxpayer advocate said more progress is needed on 16 recommendations she made in a report last summer. Advocate Nina Olson noted that the IRS’ November 2013 proposed rule on gauging political activity of “social welfare” groups had attracted an eye-popping 169,013 public comments as of June 30, 2014. “The National Taxpayer Advocate finds the sweep of ‘candidate-related political activity’ under the proposed regulation unacceptably broad,” she wrote. On Monday, Issa’s staff released transcripts that they say show an IRS information technology official contradicting Koskinen’s assertion that the missing Lerner emails are not retrievable. It appears the price of the multiple investigations is likely only to rise.